Picking up a new book is always an experience. Love it and you’re just adding to what seems like an ever-growing pull list; hate it and part of you regrets spending money on it in the first place. There’s a little fear involved, a fear that only increases when the creative hands behind the new title are those whose work you’ve previously enjoyed. Fortunately for Pretty Deadly all my (largely ignored) worries were for naught. Decidedly a western (both in setting and ambiance), Pretty Deadly manages to separate itself from the rest of genre by blurring the lines between western and fable. It would be easy to toss it into the same pile as another famous more-than-straight-western, The Dark Tower, but to do so would be constricting the story. Reincarnation is much more straightforward in this world. Death has a much larger role to play. 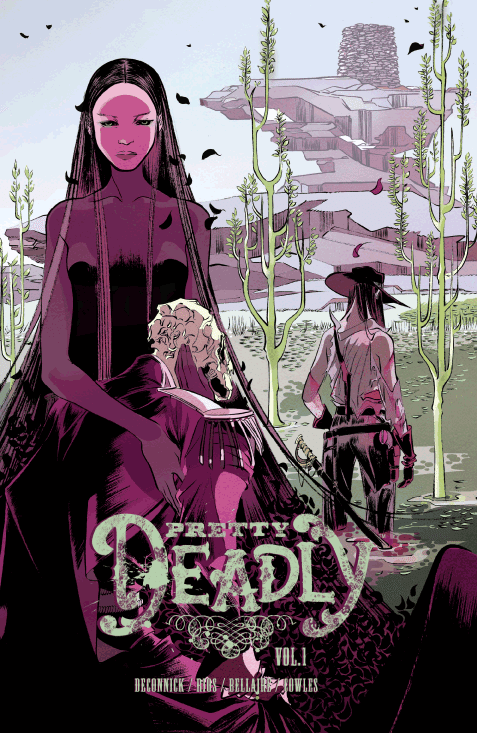 Pretty Deadly takes a bit of time to connect the dots and the pay off is definitely worth it. The reader experiences the same “aha!” moment as one of the central characters, Sissy, does. There are three stories unfolding over the course of the five issues that make up this initial arc: the story told by the bunny to the butterfly, the story that Sissy and Fox share and the story of Sissy and Fox. Each builds off the other, feeding into the grander arc until the very end. This is by no means an arc that feels completed by its finished, which is what frustrated me upon reading it in single issue form and will undoubtedly frustrate those who read the trade. There is so much build, so much piling on as characters and stories collide that the story could almost use a little breathing room. It doesn’t really end but rather just pauses. During my first read, the ending made me sit back not because it was particularly shocking or out of left field (it was a very natural conclusion, though I won’t spoil what that is). It took me off-guard because it happened so fast. Clearly there is another arc plan, one that this is more of a set-up for rather than a fully realized, standalone story. I have an affection for DeConnick’s way of telling a story though I recognize that her scripts aren’t everyone’s cup of tea. She handles these new characters with aplomb, making them feel lived-in without having the burden of decades of back story as I’d seen her gracefully pull off in Marvel titles. Life very clearly runs through the veins of this story about death and the wild west. Pretty Deadly isn’t a typical book, but much like other unusual “indie” books out there, it is worth picking up. It doesn’t take long to read, but if you’re anything like me, you’ll find yourself taking a quick break before going back and giving it another read. This book just demands a re-read and doesn’t find itself wanting the second go around. One thing is for certain: I can’t wait for more.